Dr. Leyland-Jones is best known for leading major changes in breast cancer clinical trials and treatments, as well as his ongoing focus on how genomics plays a vital role in the fight against breast cancer. When conducting genomics research and developing personalized treatments for cancer patients, biomarkers are key. Because these distinct biological indicators are so important, there is a growing and urgent need for biomarker profiling and validation in the cancer research community. As the Director of the Darwin Foundation (formerly the Consortium for Clinical Diagnostics), Dr. Leyland-Jones is partnering with scientists at research institutions and biopharmaceutical companies who are dedicated to facilitating genomic research and diagnostics. The Darwin Foundation provides a centralized infrastructure where disease genes and genetic signatures can be identified and validated. The Darwin Foundation also develops medical response tests, as well as new and improved diagnostic tests for a variety of diseases, including cancers. 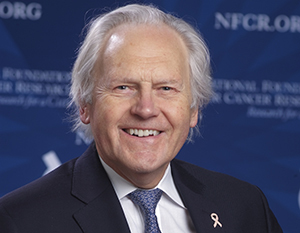 Throughout his career, Dr. Leyland-Jones helped develop drugs that are now mainstays of oncologic breast cancer treatment (such as the anthracycline, antimetabolite and platin families), as well as the targeted therapies trastuzumab (Herceptin®) and bevacizumab (Avastin®). He also helped disprove some theories about how to best treat breast cancer patients. For example, he demonstrated that two years of adjuvant trastuzumab was no better than the standard one year of treatment for women with HER2-positive, early-stage breast cancer. Additionally, Dr. Leyland-Jones helped drive global collaboration and material collections as a member of the Executive Steering Committee of the Tissue Bank Consortium in Asia that was founded and operated by NFCR. Brian Leyland-Jones, M.B., B.S., Ph.D., received biochemistry, medical and doctoral degrees from the University of London and completed his residency at Hammersmith, Brompton, St. Bartholomew’s and London hospitals. He then conducted fellowships at Cornell University and Memorial Sloan-Kettering Cancer Center. He became part of Sloan-Kettering’s medical staff, researching new anti-cancer compounds. From 1983-1990, Dr. Leyland-Jones served at the National Cancer Institute as head of Developmental Chemotherapy and he oversaw the development of approximately 70 anti-cancer compounds. From 1990-2000, he was the director of the McGill University Comprehensive Cancer Centre and the founding chair of Oncology. Dr. Leyland-Jones also served as a professor of medicine at McGill University. From 2007-2012, he was the Director of the Winship Cancer Institute at Emory University, as well as a Professor of Medicine and Associate Vice-President of Health Sciences. Dr. Leyland-Jones has also worked in the private sector. He became Founding Chairman and Chief Executive Officer of Xanthus (a biotech company focused on individualized cancer therapies in 2001), and he has been the Director of Genta, Inc. since April 2012. Dr. Leyland-Jones is also a member of the Scientific and Clinical Advisory Boards at Welichem Biotech Inc. and Antigen Express Inc. Currently, Dr. Leyland-Jones is the Vice President of Molecular and Experimental Research at the Avera Cancer Institute and the Director of the Darwin Foundation. Dr. Leyland-Jones has held leadership positions in many large medical organizations, including the Eastern Cooperative Oncology Group, the Tissue Bank Consortium in Asia (that was founded and operated by NFCR), the Cancer and Leukemia Group B, the International Breast Cancer Study Group, the National Cancer Institute of Canada and Breast International Group. He is also the Director of the Darwin Foundation (formerly the Consortium for Clinical Diagnostics) that provides a centralized infrastructure where disease genes and genetic signatures can be identified and validated. He has received many awards and honors throughout his career, including the Vivian Saykaly Visiting Professor Award by the Cedars Cancer Institute in Montreal and being named an Eminent Scholar by the Georgia Research Alliance and a Distinguished Cancer Scholar by the Georgia Cancer Coalition. Throughout his career, Dr. Leyland-Jones has written more than 180 peer-reviewed articles and book contributions, and he holds 34 patents. Your ticket for the: Brian Leyland-Jones, Ph.D.